Delivery Time 15-20 days. Return range 30 days.Please contact us if you cannot receive the order after 30 days. Shooting light problem, there may be Color difference,To prevail in kind. ★ This product is really environmentally friendly furniture material, fine workmanship, modern simple, high-capacity shoe, is your home must. ★ Note! Products need to be assembled, accessories including screws, need customers to install! ★ If you have any questions, please contact us, we will be in 24 hours to give you a satisfactory answer, thank you. We are committed to designing products that meet your home and storage needs. 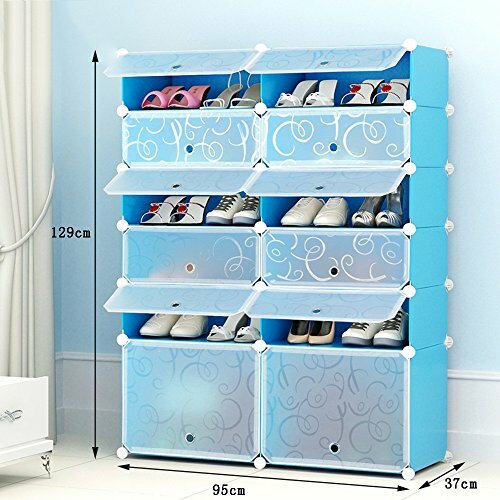 This product is Shoe cabinet, Do not include any other decorations. All the buckle round face outward, The two opposing buckles are opposite the cross. Large carrying capacity, Moisture-proof easy care,Home essential.High-capacity, environmentally friendly resin, health and safety, it is worth having. According to the size of space and individual needs, you can DIY assembly.random combinations, simple and quick. Sizes: 95*37*129cm. Product assembly is simple, easy to use. If you have any questions about this product by Shoe cabinet/Shoe rack, contact us by completing and submitting the form below. If you are looking for a specif part number, please include it with your message.